Cooking With Wine Recipes Pumpkin Soup With A Twist! Fall is in the air. Time for another in the series Cooking With Wine Recipes pumpkin soup. We are beginning to get pumpkins in our weekly CSA (Community Supported Agriculture) box from my daughter's farm, Suzie's Farm. It is the season for those gorgeous orange globes, and I have been busy trying to come up with a recipe that qualifies as "comfort food", but with a bit of a twist, which in my book means a little bit of wine! I love soups of all sorts. To me the are the ultimate comfort food. I also want something that will pair well with wine. Here is my version of pumpkin soup. In a large stock pot heat olive oil over medium heat. Add onion, celery, and carrots; cook about 10 minutes. Add pumpkin puree, ham, sage, bay leaf, wine, chicken stock, salt, and pepper. Simmer covered for 15 minutes. Add ham and simmer, uncovered, another 5 minutes, or until vegetable are tender. You may garnish with heavy cream and a sprinkle of dried sage. Serve with crusty bread and your favorite Chardonnay. Preheat oven to 350º F. Slice an eight to ten pound pumpkin in half. Place pumpkin halves on two rimmed cookie sheets with about half a cup of water in each. Bake for about 1 1/2 hours. After the pumpkin halves cool off, discard seeds, scoop out the pumpkin and puree. 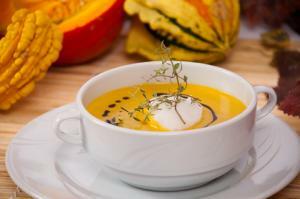 Welcome Fall With Cooking With Wine Recipes Pumpkin Soup!